Most business owners think that increasing sales is the answer, and while that certainly is part of the equation, it’s NOT the whole answer. A business can bring in lots of income and still be struggling to survive. On the other hand, some businesses bring in a comparatively modest amount of income and are in great financial shape. It’s simple. It has everything to do with how the business USES the income that determines its financial condition. If you’re like most business owners, you are super busy running your company. So let me ask you a question. How much time do you spend planning how to utilize the most important resource your business has — its cash flow — to guarantee you achieve your financial goals? Money management planning is the missing step. It’s the step that business owners were never trained to do. That’s why I created the Business Checklist to Increase Profits. 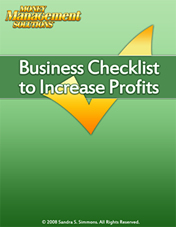 What is the Business Profits Checklist? It’s a list of money management planning steps that you can use to guarantee that your business income is used to attain your best financial advantage and maximize profits. Why do you need this checklist? This checklist points out not only WHAT TO DO and WHY to do it, but also HOW to do each step — this eliminates the usual accompanying headaches that result when you don’t have a proven action plan to follow. This checklist saves you from wasting a tremendous amount of talent, time, and money, regardless of the size of your company. It’s the road map for the at-the-desk or in-the-board-room money management planning session where real solutions get hammered out. It has worked for sole proprietors to Fortune 500 corporations because it is based on fundamental, time-tested business money management principles, and it can work for you. The Checklist answers critical questions and provides detailed steps for you to drive up sales AND profits, all in a format that is easy to understand and and execute! How can I get my staff to produce more sales and income for the company? What is the best way to keep my staff from wasting money? How can I make sure my staff meets their production targets? 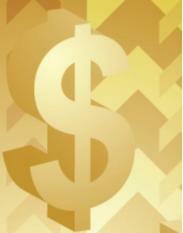 What is a workable strategic plan for the company to become debt-free and cash rich? Where are some sources of quick cash hidden on my business premises? How should I pay for unexpected emergencies that arise in my business? What is a fail-safe way to spend less than I make each week? How much money should I use for advertising and promotion expenses? What is the best way to manage my cost of goods sold – inventory, supplies, subcontract labor? How do I insure I’m making an adequate profit margin? How often should I raise my prices to keep up with the cost of doing business? How should I decide whether or not to discontinue a product or service? How would I decide which new products to offer my customers? How can I quickly pay off my credit debt? How can I do all my money management planning in less than 20 minutes per week? 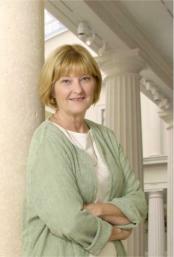 “My name is Sandra Simmons. After holding executive marketing management positions with Fortune 500 corporations for many years, I decided to start my own company in 1995. The goal? I wanted to help business owners, whether that help came in the form of boosted sales and profits or in help to turn around a failing business and make it successful. Being a business owner can be challenging indeed. The Business Checklist to Increase Profits covers 22 strategies that you can put into action to boost your business profits. These actions work for me, and for my clients. They can work for you too, wherever you are located in the world, whatever business you own. Use them and see for yourself how they can work for your business too. The Checklist to Increase Profits Gets Results! This checklist has been proven to increase profits in many businesses. We’ve been helping business owners implement the points in this e-manual for years and watching as they lead to the continued success of our clients. From engineering firms to physicians’ practices, from companies on the verge of bankruptcy to businesses just needing a boost in profits, this checklist, when diligently applied can dramatically improve the bottom line. 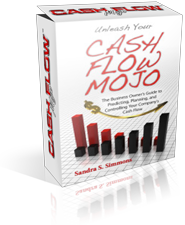 Download this e-manual and begin increasing the profitability of your business today! Your satisfaction and success are paramount. We offer a 100%, 90-Day money back guarantee for a full refund if you apply all the points of the checklist and do not experience any profit increase. So, cliché as it may seem, you truly have nothing to lose, but much to gain.